Publishing transport books, generally of London, since 1975. 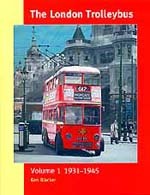 The first book published was "Trolleybus" by Ken Blacker. 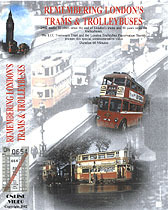 Now long out of print, but two new volumes entitled "The London Trolleybus" are currently available. Volume 2 is a major piece of work which has been several years in the making with all pictures selected from the collections of every know post war photographer of London's trolleybuses. Meticulous attention has been given to the historical data making this a reference book which every trolleybus enthusiast should own. A full listing of books currently available is shown on their WEB site with details of how to order on line or by post. Email them for more information. The sleeve of this DVD [from Artsmagaic Ltd, PO Box 25, Ebbw Value, Blaenau, Gwent] entices a purchase by saying: "The history of the Trolley Bus is almost as long as the trams they were designated to replace. This video looks at the development of the Trolley Bus from its earliest days through to its peak in the 1930's". Seems good value too, at £6.50, and you tend to get excited with its probable contents as it sports a picture of London trolley 1521. What historical scenes are we going to be treated to, and what systems would be covered? Well in truth, none, just forty five minutes of very amateur cine film taken mainly at Carton Colville, with perhaps a third of the film devoted to movements of trolleybuses at Sandtoft; all probably shot in 1996. Fleeting glimpses of London trolleybuses are seen, but none under power. The intrusive inappropriate background music is annoying enough but the accompanying commentary would make the liveliest brain fall quickly into a comatose state. As someone closely involved with 8mm film shows, presented by the '0' Gauge Group of the Tramway and Light Railway Society in the 1960's showing the 'real' thing, I can categorically state that the material found on this DVD is best describe as fodder for the cutting room floor. It was an exciting thing to see specialist films finding their way onto DVD, rather than the more usual VHS format, but this is one DVD that should not grace anyone's collection. The Middleton Press publisher, Vic Mitchell and series editor Robert Harley, have together produced a specialist range of books for the Trolleybus and Tramway enthusiast. Publications from this stable are books on trolleybuses, notably "Croydon's Trolleybuses", by Terry Russell on this site] and "Woolwich & Dartford Trolleybuses" by Robert Harley. Paul Atchinson has painted for many years capturing a wide variety of subjects, but specialising in transport, particularly buses. A number of his bus, trolleybus and tram paintings are available for purchase from his WEB site, as limited edition prints and includes a painting of London Transport trolleybuses in Ilford. Paul is happy to discuss one-off commissions. Whether you are an Enthusiast or Professional, let Railbooks.com be your transport bookshop. No matter where you are, whether your interest lies in railways, tramways, or trolleybuses - be they historical or modern - Railbooks.com has hundreds of shelves through which to browse. The year 2002 marked two major London transport anniversaries - the end of the first generation of trams in 1952 and the demise of trolleybuses in May 1962. To mark these occasions the LCC Tramways Trust and the London Trolleybus Preservation Society have in co-operation with ONLINE VIDEO produced a special commemorative video aimed at both the general public and the enthusiast. Priced at £14.99 it is available from the LTPS, 19 Fieldfare, Sandy, Bedfordshire, SG19 2UZ who will use the profit generated on preservation projects. Richard Berridge has been drawing steam engines for as long as he can remember, whereas London trams and trolleybuses left him with early memories of the terrors of the descent into the Kingsway tram subway to visit an uncle in Forest Hill, and frequent visits by 662 trolleybus to an aunt in Harlesden. Details of how to purchase a print [560*410mm - thumbnail shown] of a 1948 tramway scene at the Alms Houses in Croydon are given, with the promise of a further painting to follow of open-top trams on the last days of operation [and trolleybuses on test] at Crystal Palace. TROLLEYBOOKS has been around for more than a quarter-of-a-century. 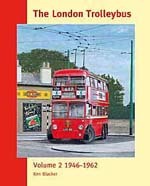 Quite simply, they are UK trolleybus enthusiasts publishing English language books about trolleybuses. 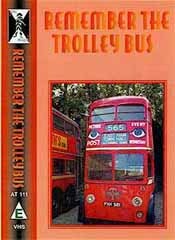 They feel a need to document trolleybus history in some detail as it is virtually 30 years since the last one in Britain ran in public service, TROLLEYBOOKS sees to it that this particular bit of social history isn't forgotten. © 2005 David Bradley. This page is part of "David Bradley Online". Go to Home Page.